Here is the Tour Easy It has been stored for a while so it is still a bit dusty. Twin chainwheel and 6 speed non-indexing rear wheel. Windwrap fairing to go with it but no brackets. Nice and light, probably one of the easiest recumbents to ride. 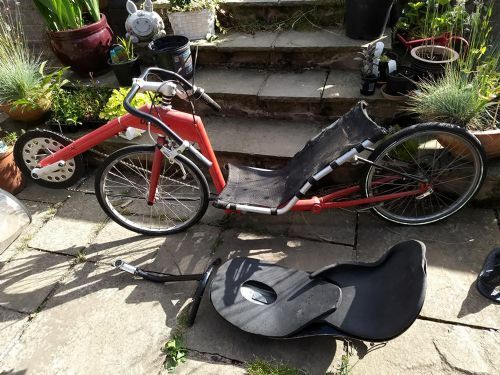 Standard seat and handlebars + hard shell seat and Hamster bars. Boom has been lengthened at some point (presumably to fit a tall rider) Short cranks. Easy to ride with the standard bars. Bits and pieces now gone. 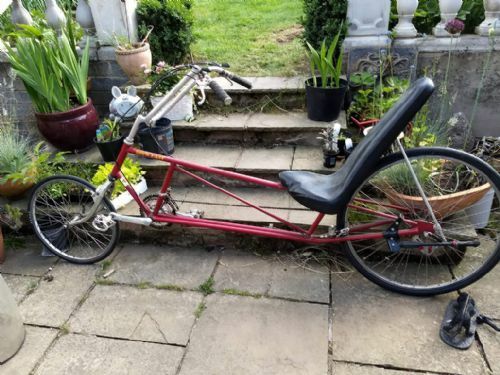 The Festina is a low-cost way into recumbent racing. Hi Paul, what is the best price on the Festina please?